I'm always looking for a new, interesting, or unique perspective on a common subject. 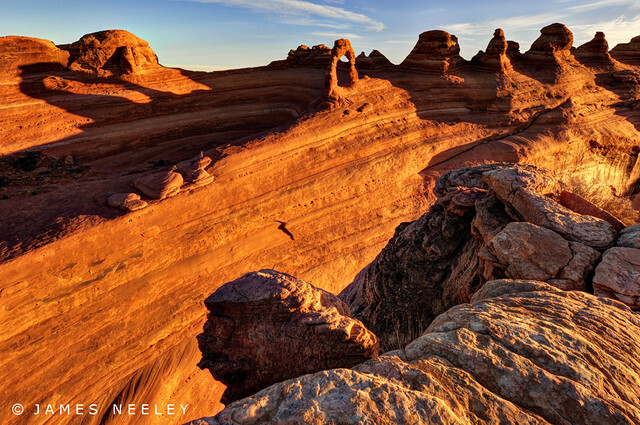 And so shooting this image has been a rewarding project for me and motivated a quick early winter trip to Moab, Utah and Arches National Park. 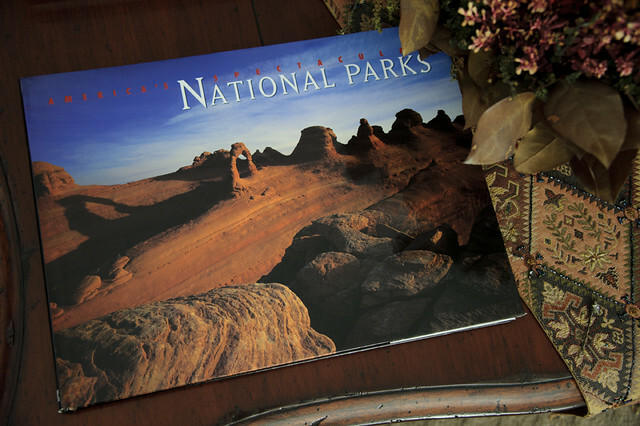 It all started last Christmas when my Brother and Sister-inlaw gave me this beautiful National Parks photography book. I was immediately struck with the cover image of Delicate Arch and it's shadow from a perspective I had never seen before. Voltaire said "Originality is nothing but judicious imitation." So with this thought in mind I decided to attempt my own spin on this beautiful and unique image. And so started a year long project. The first thing I needed to do was find out the time of year the image was taken. I used an ipad app called LightTrac to determine the time of the year that the arch shadow would be in the position in the cover photograph. This app is very helpful in planning sunrise and sunset shoots especially if you are not familiar with an area. 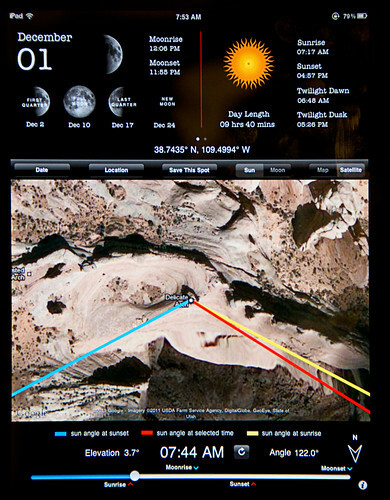 It will also show moonrise times and angles which is awesome if you want a moonshot! It seemed to be December. And so I would have to wait a year for the attempt. Another thing was that there was no snow or wet rock. Arches often gets snow in December and January so I thought to make the attempt late November or early December. Next I had to determine vantage point. 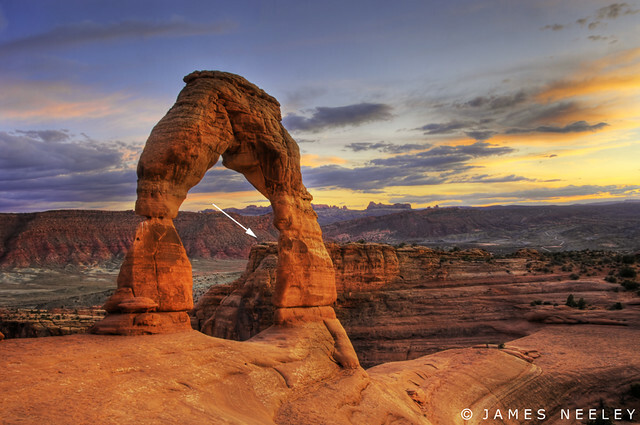 Using Google Maps Satellite view I was able to determine that the shot was taken from a ledge to the south of Delicate Arch. The ledge is often visible on images of the arch from a more traditional perspective. I had just never noticed it. Now I had to plan to get to that point at sunrise. I figured I would be hiking in the dark and I had never been there before so I again used Google Maps to determine the waypoints for the location and the point where I would need to deviate from the normal trail. I also wanted to make sure I was walking on rock and avoid any cryptobiotic soil that may be present. This is a very important consideration if leaving a prescribed trail to avoid any environmental damage. If you don't know what cryptobiotic soil is find out before you leave the trail! 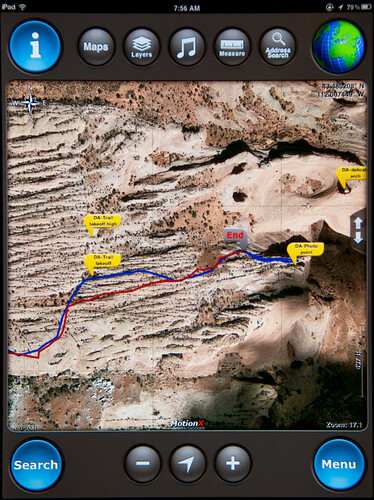 Finally I entered the waypoint coordinates in another Ipad app called MotionX-GPS HD by MotionX. I also downloaded the Google Satellite image and cached it so it would be visible on my hike. The blue line is my track the first morning. The red is the track the 2nd day. It was then a piece of cake to follow the trail with my Ipad and deviate at the proper point even in the dark getting me to my destination 30 minutes before sunrise. James, I could not find an app called "GPS HD" by MotionX or anyone else on the app store. Is that the correct name of the app, and if so, where did you obtain it. Great shot and a very interesting post. Search for MotionX and you will find it. Okay. I find "MotionX GPS" and MotionX GPS Drive". I assume MotionX GPS" is the one you're describing?